2013 Summer Camp Registration Now Open! Campers receive hands on instruction from Big Train players. We at the Bethesda Big Train are proud to announce our 2013 Bethesda Big Train Summer Camps schedule! A staple in the community for more than a decade, our summer camps have expanded over the years and are easily the top baseball camps in the area. Last year, we were able to add the Washington Baseball Celebrity Camp to our roster and it was a huge success, so this year we are adding even more to the schedule! TO VIEW A DETAILED SESSION SCHEDULE & TO ENROLL IN OUR SUMMER CAMPS, CLICK HERE! Before we get to the new stuff, let's cover the returning favorites. Bethesda Big Train Summer Camps will run General Camp, Advanced Camp, and Pitching Camp just like in summers past. While most baseball camps have high school baseball players as coaches, the Big Train camps use the Big Train players and coaches. As college baseball players from some of the top schools in the country, our players are often picked in the MLB draft and will help your kids get the instruction they need to be their best! We also offer early drop-off and late pick-up if needed. 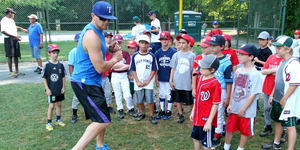 The Washington Baseball Celebrity Camp (July 22-26) will also return in 2013. Though Chad Cordero, who led last year's camp, is making a comeback to professional baseball, former MLB pitcher Garrett Stephenson will be leading the daily camp program. Stephenson is a local product who pitched 123 games in the MLB and won 16 games in a season for the St. Louis Cardinals. Like last year, the camp will include visits from Nationals players and mascots. Ross Detwiler, Michael Morse, Wilson Ramos, Roger Bernadina and others have been invited to appear, as well as Racing President and Big Train friend, Teddy Roosevelt. Also returning will be the special prizes and awards for the outstanding performers! The first new addition to this year's schedule is the Baltimore Baseball Celebrity Camp (June 24-28). Former Oriole draft pick and pitcher Garrett Stephenson will lead this camp as well. Much like the corresponding Washington camp, the Baltimore camp will also include special guest appearances from current and former players, an appearance from the mascot (The Oriole Bird! ), and special prizes and awards! Don't miss out on the inaugural year! The biggest addition to our schedule is the Garrett Stephenson Baseball Camp (July 29-August 23). One of the only complaints we've ever received about our camps is that there just haven't been enough of them. Well, with these new camp sessions, our camps will extend through the month of August so your child can continue to learn from the pros for a few more weeks. As you might have guessed, former MLB pitcher Garrett Stephenson will lead these camps and teach fundamentals to advanced mechanics. These camps will also include special prizes and awards for the top performers. Don't forget that you can buy a Family Season Pass for the 2013 Big Train season at half price if your child is signed up for one of our camps! We hope to see your kids out on the fields for another great year of Big Train camps and also, Big Train games at night!